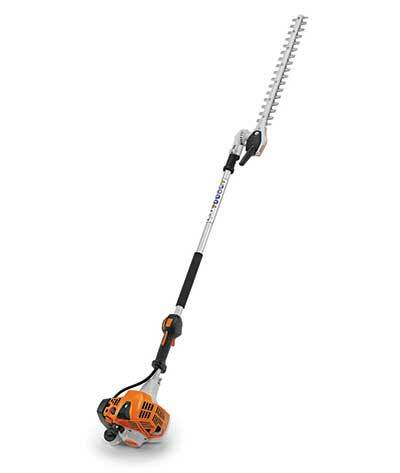 STIHL HL 94 K (145 degrees) extended-reach hedge trimmer. Stihl is launching a new of line of gasoline-powered products, specifically designed for easier use, less maintenance and longer run times, the company said. This spring, the professional models will come with a host of new features and enhancements. The new string trimmers, edgers, KombiMotors and bed redefiner are designed with larger fuel tanks, providing 30 percent longer run times than the previous models. The new units boast a simplified three-step start procedure enabled by the semi-automatic choke lever, and each product’s vertical pleated paper air filter allows for better filtration, extended replacement intervals and long service life, Stihl said. In addition, the redesigned and lighter gearbox on the new pole pruners and extended-reach hedge trimmers shift weight to the powerhead of the unit for balance and maneuverability, helping users work for longer periods with less fatigue. Four extended-reach hedge trimmers: the Stihl HL 91 K (0°), HL 94 K (0°), HL 94 K (145°) and HL 94 (145°). Other new Stihl products to be introduced this year include: nine battery products, launching as part of the new Stihl Lightning Battery System and nine additional gas-powered models, including a new line of STIHL pressure washers.